- Developing organizational continuity of operations plans. - Proactively assisting their communities with preparedness. - Pre-planning for recovery and actual disaster recovery. More detailed information on these topics can be obtained from Web sites referenced at the end of this document. Typically after disasters, the vast majority (80%) of the affected population is able to manage its own recovery. The remaining 20% will need special assistance that CDOs and nonprofit organizations are uniquely positioned to provide. The kinds of assistance victims need varies greatly based on the type of disaster or crisis that has occurred and on each individual household's particular circumstances. CDOs have aided their communities' recovery from disaster with counseling services such as foreclosure prevention, help with the Federal Emergency Management Agency and Small Business Association (FEMA and SBA) process, disaster recovery case management, rehabilitation services, recovery fundraising, volunteer management, new construction management, assistance in development of economic recovery, temporary housing to disaster victims, funding for day care, providing meeting spaces for recovery planning, communication with clientele, mental health services and so on. CDOs have also worked with local government to create a recovery that is sustainable and creates a better community than prior to the disaster. CDOs have responded to the needs of their existing clientele as well as disaster victims who were not in need of the CDOs' services previously. In order for CDOs to be positioned to provide assistance they must still be operational after the storm has passed. The first section of this handbook is a workbook designed to assist CDOs with step-by-step development of an organizational business continuity plan (BCP). The second portion of this handbook lists steps that organizations can take to work with emergency management leaders in their communities to encourage individual households and communities to be better prepared for natural and man-made disasters. The third and fourth sections of this handbook address issues associated with recovery. 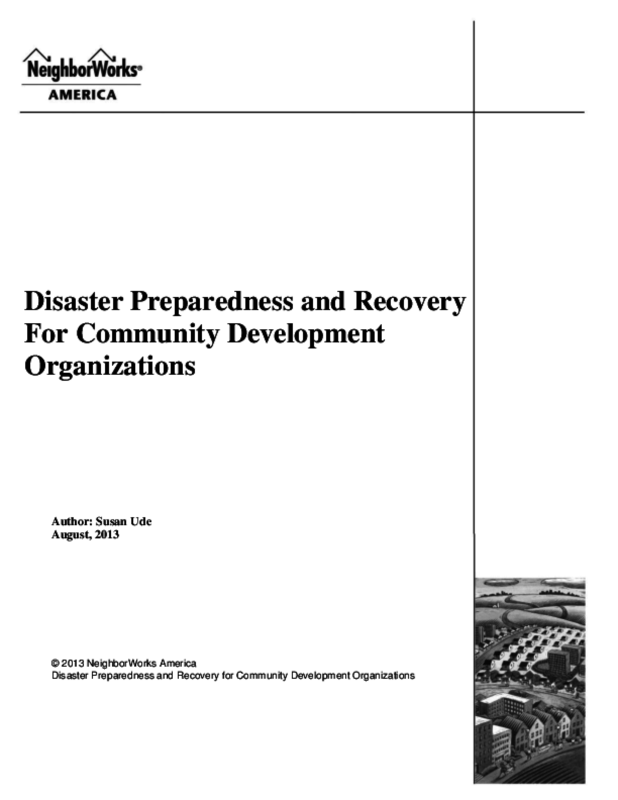 There is a guide to pre-planning for recovery, a guide to developing a disaster recovery notebook and best practices, and considerations and opportunities for housing, economic and community recovery are suggested. A resources section is included to provide additional information on preparedness for and recovery from disasters.